Today is the 3rd time we went for kite-flying at West Coast Park, thanks to my brother-in-law, Tim who made us a kite when he came to Singapore with May & Aren last month. My husband, Terry & I decided to try if the kite "can fly high" when we woke up to a breezy morning three weeks ago. 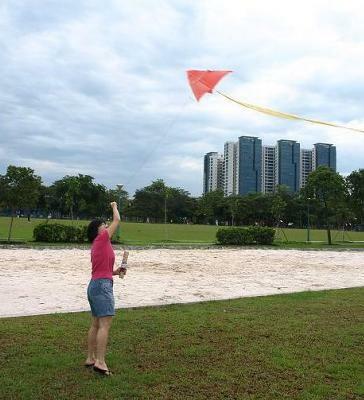 We went to West Coast Park as we heard that it is a popular place for kite-flying. There is a big field at the park but it was quite crowded with people playing baseball. We saw two kites in the sky though not very high up. We found a good spot which is less crowded. Terry asked me to hold on & position the kite and released it when he told me to. We were quite lucky, the wind was strong & it took just a couple of minutes the kite went up to the sky. I was so excited to see the kite went higher & higher. When I tried to take a picture, it has gone really high up & could only see a tiny dot in the sky. Terry told me it could have gone even higher but the string is not long enough, he even need to hold on tightly in case the kite "gone with the wind". When my turn came, the wind die-down, the kite came down slowly and it did not go up again. What a pity! We spent about an hour. I can't wait to tell Tim & May that the kite CAN FLY REALLY HIGH! Last week I got a chance to fly the kite "all by myself" and Terry took a few pictures to show Tim & May. The wind was not strong enough, so the kite did not go high but just stayed at a height of a tall tree. Then the sky getting darker & started drizzle, we packed up & went home with disappointment. It was very sunny this morning. We went to the same place and same spot. There were two young children flying kites in the shape of butterfly & bird. Another two families also tried to fly their kites but were not successful. The wind was strong, without much effort, the kite soon went up to the sky. It followed the direction of the wind & went out to the sea. When the wind suddenly turned weak, Terry & I got panic afraid that the kite might drop into the sea. We quickly retrieved the string thank God we managed to get the kite back in time. Compared with other very beautiful kites, our "simple kite" flew highest & stayed longest in the sky. Tim did a great job!! Although it was windy, the sun was too strong. We could not bear with the heat, got sun burnt. Glad that both of us had a chance to fly the kite high and steadily this time. I think my kite-flying skill improved each week, if Tim & May were here to witness it. Kite-flying has became a weekend activity for Terry & I. We enjoy the fun & quality time together. Glad to hear about successful Delta flights! Thanks for the long and detailed post Karine! Glad to hear how you and Terry got some decent flights out of the little 1-Skewer Delta I rather hurriedly put together on the last day or 2 of our holiday.